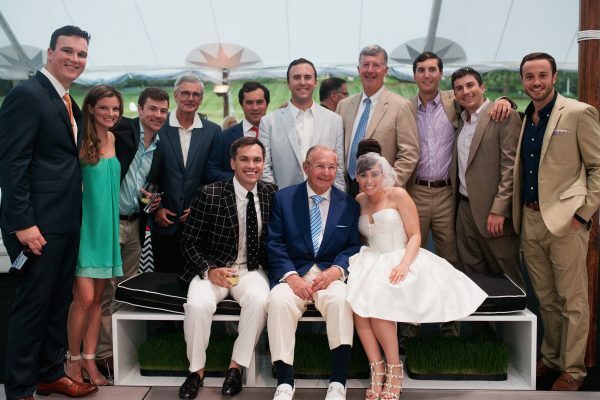 Center: Tyler Lenczuk ’08, Richard Duchossois ’44 and Danielle Galanti Lenczuk are flanked by a group of W&L alums. When Tyler Lenczuk ’08 married Danielle Galanti in July 2014, they were given a gift like no other — a named scholarship fund to benefit future Washington and Lee students with financial need. 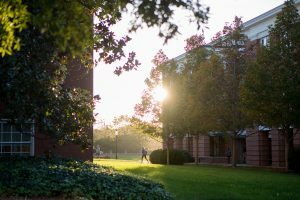 The Office of Financial Aid will match the first Tyler R. and Danielle G. Lenczuk Scholarship recipient this year. The unique wedding gift touched the newlyweds and gave them a personal legacy at W&L. While the gift itself was a nice surprise, the fact that it was not traditional was nothing new to Lenczuk. “My grandfather stopped giving gifts in the traditional sense because he wanted the act to mean something special in our lives,” he said. “This was a creative way to give a wedding gift; it certainly beat getting a serving tray we’re never going to use,” he joked. Duchossois was instrumental in recruiting Lenczuk for W&L. Having gone to a large high school in the Midwest, he never imagined himself attending a small college in Virginia. However, after a special trip with his grandfather, which included attending a lacrosse game as well as stopping by Duchossois’ dorm room in Graham Lees, he was sold. Lenczuk said he got goosebumps as he stood outside his grandfather’s room. 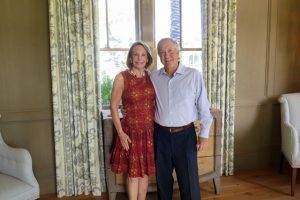 “My grandfather relayed to me that being well-rounded with a liberal arts education was important, and I couldn’t agree more,” he said. Becoming an alumnus himself further strengthened the bond between the two. Now, Lenczuk works for the family business, The Chamberlain Group, on the emerging business team, to identify and develop new opportunities beyond the core business. The company designs and engineers access-controlled entry systems, such as garage door openers and gate operators. He worked his way up in the company after spending a few years working in commercial real estate.